Incredible views of Sapphire Beach! Corner unit, 2nd floor privacy, Keyless entry! We also own the unit (beachfront) below it so if you need additional accommodations due to wedding, family reunion or traveling with friends, please check out our other VRBO listing #720774. Included are chaise lounges, table & chairs, new blinds, all new appliances, high-speed WIFI included, 2 sets of snorkeling gear, King Bed that is super comfortable, all new amenities, blender, coffee maker, hair dryer, (1) large flat screen TV, air conditioning & 2 new ceiling fans; double sliding glass doors that open onto the deck; umbrellas, beach towels & amazing sunrises included. The rates quoted are for two guests ONLY. The condo & marina complex is gated with a security person at the entry. Security personnel walk the grounds day & night. Beach lounge chairs are included at no cost to our guests. You'll find glasses, stemware, silverware, cooking & serving utensils if you want to visit the local grocery store and cook-in. Rentals of kayaks, wind surfing & other water equipment are available at the dive shop located on the property. Other activities: kayaking, parasailing, paddle boarding, boating, day cruises, shopping. Charlotte Amalie is the capital of Duty Free shopping. It's approximately a 30 minute drive. Your trip to paradise begins by calling or emailing us! Having lived in Colorado for over 37 years, we set out to find a beach property that we would want to come back to year after year. Our search started in 2007. 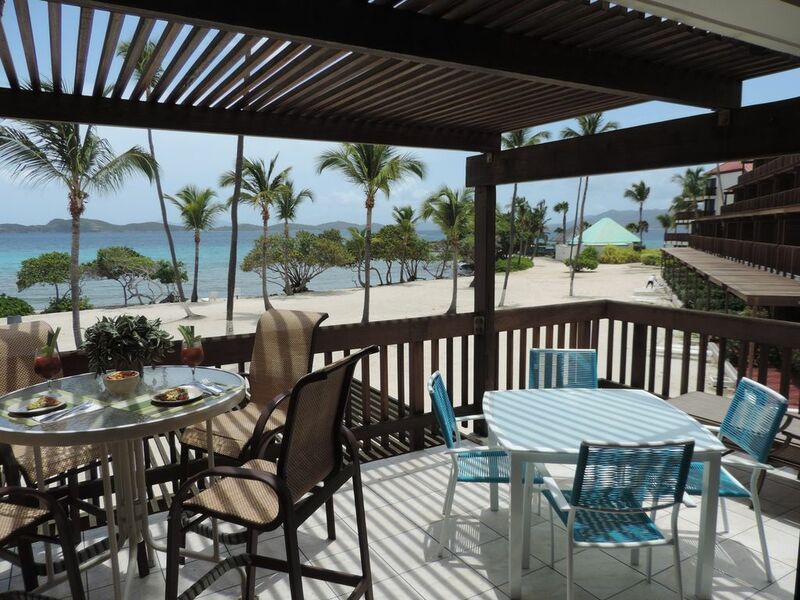 We scheduled a trip in April, 2013 to St. Thomas/Sapphire Beach Resort & Marina booking one of the properties using Home Away. We walked onto the beach that was just 20 feet away from our outdoor sitting area. My husband said "I think we just found what we have been looking for". We hope you enjoy our new beach home as much as we do! Our goal was to think of everything so you want for nothing as our guests. This is the most beautiful secluded beach we have ever seen in all of our travels. We wanted property in the US and it does not get any better than this. Walk a few steps from the condo & you can do some amazing snorkeling. There are two coral reefs. The sands are pure white. Walking the beach morning & night, beautiful sunsets, afternoon rains, iguanas, crystal clear, warm water, beautiful fish, not crowded, 2-tier infinity pool that is framed on all sides by the ocean (see pictures). Take a day trip on one of the sailboats docked at the marina there on the property. St. John's is a quick 10 minute ferry ride. toilet, shower, You'll find all your beach towels here! Free In front of building - lots of it! Gorgeous pool - 2 tier, surrounded by the ocean. Bring camera for amazing pictures!! * There are several umbrellas for your use, if needed. * There is a new fan in the closet if you need additional breezes for sleeping. * In case you forget yours, we have a pair of binoculars so you can watch the sea! * There is volleyball and yoga on the beach! * We have gone to great lengths to make sure your stay is as wonderful & as relaxing as possible! My sister and I have traveled to the VI often and this was our first time staying in one of the condos right on the beach at Sapphire Beach. Our first impressions upon walking in were - WOW! Of course, the view grabs you right away but then we looked around at the furnishings and things that were included and were greatly impressed that this condo is exactly what the photos show you. It is spacious, well furnished and completely perfect for our 5 night stay here. We stayed from 4/8 through 4/12. Kitchen was well appointed and had everything we needed to make breakfast and lunch. The king sized bed is the most comfortable bed I've slept on in any vacation rental, ever. The taxi stand out in front is very convenient for our nightly excursions to Red Hook for dinner. LOTS of restaurants to choose from for any taste bud. The ferry and Red Hook are just a 5 minute taxi ride which cost $4 each. Scott, who lays out your chaise lounge in the morning, is awesome and super friendly. Tips are appreciated. Also, LOVE the keyless entry - very convenient! If you can grab this condo for your vacation, do it! Thank you Dave and Lynn for the stay! We have enjoyed this property for many years. Good location, beautiful views, well-appointed unit. And owners are a pleasure to work with. Thank you for a wonderful vacation! Thank you Donna for your thoughtful review. We always love hosting you and your family. When you return next year you'll be able to enjoy a fully renovated unit with new kitchen with dishwasher, plank flooring and granite countertops. Hopefully we'll have new A/C for the entire complex by then as well. Love this condo, can't wait to go back next year! Thank you Lorraine and Bob for your thoughtful review. We loved hosting you this year and look forward to seeing you for your extended vacations for years to come. When you return next year you'll be able to enjoy a fully renovated unit with new kitchen with dishwasher, plank flooring and granite countertops. Hopefully we'll have new A/C for the entire complex by then as well. This was a great property! Everything met and exceeded the description. We had a fabulous stay at Dave and Lynn’s property. The location was great for what we planned. The accommodations were lovely and comfortable. Dave and Lynn could have not been more helpful with answering questions and giving us suggestions for places to eat, shop and even rent a car when Hertz never came through with a car for us even with a reservation made 6 months prior. The vacation on St. Thomas was perfect. We will definitely rent from Dave and Lynn again. We are planning to make a return trip soon! Jan, Lynn and I thank you and your family for choosing our beautiful beachfront units and are happy you enjoyed Sapphire Beach Resort , the new grill and bar and both of our corner properties. It was a pleasure hosting you and we are appreciative of your 5 STAR rating for our offerings. We look forward to your return visit! We stayed in this unit from 1/5 - 1/14. The view was spectacular - literally on the beach as close as you can get to the water in St Thomas! The unit was exactly as described, and was roomier than the pictures even showed. It was great to have some extras (they had snorkeling gear, beach towels, beach blankets and a cooler for us to use every day). The location by Red Hook was perfect - we were less than a few minutes to many great restaurants, the car ferry & the ferry to take you over to St. John. We actually got to meet Dave & Lynn while we were there - what wonderful people. We will be coming back to stay in 2020!! Thank you Carri for your thoughtful review. We loved hosting you this year and look forward to seeing you for years to come. When you return next year you'll be able to enjoy a fully renovated unit with new kitchen with dishwasher, plank flooring and granite countertops. Also looking you new outdoor furniture. Hopefully we'll have new A/C for the entire complex by then as well. It is a very nice place with a great location. Owners were very helpful with things that were needed. Thank you Susan for your thoughtful review. We loved hosting you this year. When you return next time you'll be able to enjoy a fully renovated unit with new kitchen with dishwasher, plank flooring and granite countertops. Hopefully we'll have new A/C for the entire complex by then as well. The rates quoted are for two guests per night. Additional guests are charged at a rate of $25 per person per night There is a 3% fee for using a Credit Card which fee will be deducted from the Security Deposit. This is the charge for the credit card company to process the transaction.